BEST REGARDS AUSTRALIAN SKY AND WEATHER. Australian Sky and Weather....Trentham Vic. The Central Ranges area extends from Ballarat in the west to Kilmore in the east and from Kyneton in the north to Gisborne in the south generally incorporating the Central Ranges above 400m. The area is normally referred to in the official forecasts as the North Central, however AUSSKY wishes to present a specialised experimental forecast for the areas previously outlined where climatic conditions can be significantly different from northern parts of the formal North Central region. During winter months, the Central Ranges are susceptible to frost, ice and snow, often mixed with fog, while in summer months, considerable variation can occur in temperature between the southern slopes and the northern slopes separated by the ridgeline. Another significant feature of the region are the local phenomena of strong ridge winds, especially in summer, associated with south and southeasterly low level winds. In respect to elevation, a good deal of the Central Ranges are in excess of 600m, between Ballarat and Woodend, with the highest points in this area approaching 900m south of Trentham and Bullarto. Another region of significant height is found at Mt Macedon, where elevations exceed 950m with Camels Hump rising to 1013m. RAINFALL: The entire region exhibits a bias to winter maximum associated with orographic forcing of troughs and fronts during that season. Minimum amounts of rainfall occur in the summer months, particularly in January to March. Overall, rainfall amounts range from near 700mm on the western margins, to reach near 1300mm at Blue Mountain south of Trentham. East of the Trentham Rise, annual rainfall declines to reach near 850mm at Woodend and approaching 700mm at Kilmore. The Mt Macedon Ranges exert a local influence with the summit approaching 1000mm, and Mt Towrong approaching 1200mm annually. To the north of the ridge, rainfall amounts decline rather rapidly, with 750mm average at Kyneton declining to 575mm at Redesdale only 30 or so km to the northeast. During wintertime there can be prolonged periods of fog and drizzle on and north of the main ridge with cloud rapidly breaking to the south. During the summer months, persistent south or southeasterly winds bring drizzle and fog to the southern slopes and ridgetops especially at night and early morning. In the summer period cloud rapidly breaks to the north of the ridge to reveal fine and clear weather. SNOWFALLS: The entire region is susceptible to occasional light snowfalls in winter, mainly between the months of May and September. Most falls are generally light and rather insignificant, and are of a snowshower nature. Most snowfalls are associated with cold Southern Maritime or modified Polar airmasses. Heavier falls are occasionally experienced usually every 2 - 5 years when the entire region may be covered to a depth of between 2 and 5cm. At Trentham (elevation 700m), a 40 year mean average occurrence is about 4 snow days per year, mainly occurring in July and August. At higher altitudes, snowfall occurrences increase rapidly above 900m. At Mt Macedon (1003m), snowfalls can be recorded on 15-20 days a year with snow lying occurring on 10-15 days a year. It is estimated that 1 annual snow day occurs near 500m elevation. FROST:The entire region is susceptible to severe frost, generally between the months of May and September. Light frosts have been recorded in all months. The period of minimum frost incidence occurs between January and March. Temperatures will approach -5�C on several occasions each winter, but there can be significant variation over short distance in the severity of frost. Extreme minimums have been near -10�C - Mt Macedon with -9�C and Trentham - 7.5�C. A feature of the region in winter is the occasional appearance of Black Ice, mainly occurring at elevations above 500m. The occurrence of black ice can cause major traffic disruption across the region. 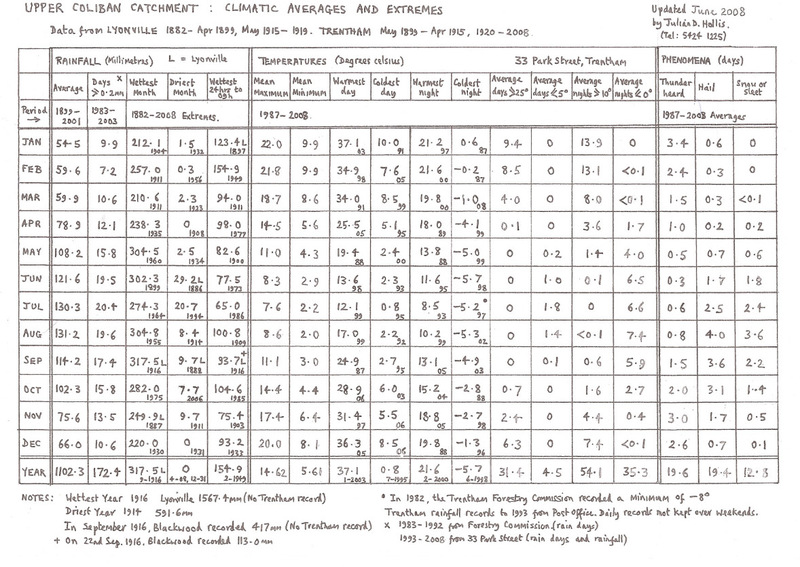 THUNDERSTORMS: A 40 year record taken at Trentham (24 hour), indicates a mean annual average there of 20 thunderdays. This is a reasonable representation of the Central Ranges. Annual thunderday incidence is extremely variable from year to year. Severe thunderstorms with hail, strong winds occur annually, mainly between September and March. Tornadoes have been reported on rare occasions. Some of Australia's most severe tornadic activity has occurred on the northern slopes of the Central Ranges. Thanks to The Bureau of Meteorology, SSEC Wisconsin and the CSIRO, for allowing use of the images and information. � Australian Sky & Weather 2018. Neither any information provided here nor any part thereof, as provided by Australian Sky and Weather, may be reproduced in any form or using any medium without the sole and express written permission of Australian Sky & Weather. The information provided on this website should not be relied on in lieu of officially disseminated weather forecasts and warnings. This site is an experimental means for disseminating weather information through the Internet to a broad range of users.